The No1 rig when legering for pike or zander! It's easy to create, it's easy to cast, it's virtaully tange-free and it provides absolutely excellent bite registration. It features a very long paternoster link that has a large bomb and one end and a large diameter swivel at the other. All you need to create this rig is a 2-3oz bomb, some spare 10-12lb mainline, a large swivel, a large bead, your pike trace, some spare pike wire, a couple of Bait Poppers, wire cutters and a pair of forceps. Firstly, you will have to attach a couple of Bait Poppers to your wire trace to ensure that the deadbait is lifted off the bottom and away from any weed. Now cut off a 2ft length of 10-12lb mainline and tie it securely to your heavy leger bomb. Next you will need to tie a large swivel to the other end. This link needs to be at least 6in longer than your wire trace, so measure it first before tying on your swivel. The best knot to use to tie your swivel and bomb to the line is a grinner knot. Thread your mainline through the eye of the link's swivel, and then through a bead. 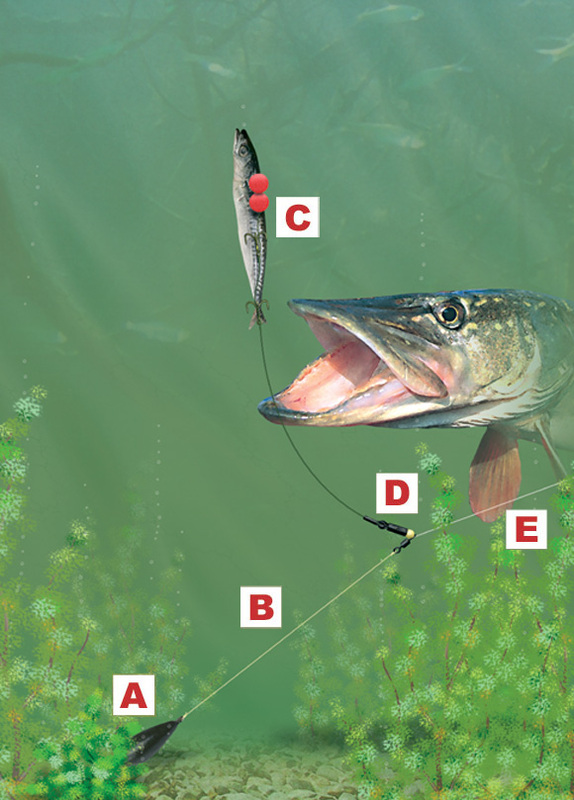 Finally attach your pike rig onto the end of your mainline using another grinner knot. This rig casts really well, plus you can see whether it has become tangled throughout the cast. It's best to swing the lead around the wire trace before casting so that it rotates immediately before casting. This will keep the trace hooks and the leger link separate and therefore tangle-free. E - use 12lb mono or 30lb braid as your mainline.